The constitutional enactment of national prohibition in 1920 and its progressive aim of uplifting American society only lasted until 1933. Public opinion evolved in those thirteen years from supporting national prohibition to denouncing the attempt at legislating morals. Prohibition has generally been ridiculed in American history as a failure. No other state defines the failure of prohibition better than the State of Maryland from 1918-1933, especially in the defiant urban center of Baltimore. Maryland was unique in its reactions to prohibition. It was the only state to never pass a state enforcement act, proudly labeling itself as a wet state. Prohibition in Maryland was seen as an infringement on states’ rights to enforce and control liquor traffic within its borders. Therefore, national prohibition would not be supported by the infringed upon state. Between 1920 and 1933, the U.S. was legally a dry nation. Prohibition attempted to outlaw the manufacture and distribution of alcoholic and intoxicating beverages. Historians have generally agreed that those who led the prohibition movement were the middle-class reformers who were often the activists in the progressive movement. Since alcohol was deemed by these people to be one of the most prodigious evils that plagued the lives of Americans, the eradication of alcohol was initially a colossal victory. Calls for temperance and prohibition existed before the United States was a nation. Paradoxically, Maryland is credited with starting the anti-liquor movement in 1642 when the colony punished drunkenness with a fine of 100 pounds of tobacco. The modern temperance movement had its roots firmly planted in the early- to-mid-nineteenth century. In 1826, the American Society for the Promotion of Temperance was organized in the city of Boston. Ironically, the Washington Temperance Society was formed in April 1840 at a tavern in Baltimore, Maryland by reformed drinkers. Repeated attempts to pass local and national prohibition laws were made during the mid-1800s through the early twentieth century. In April 1917, the United States declared war on Germany and entered World War I on the side of the Allies. Most historians agree that this international conflict was vital to the prohibition movement. The need to ration and regulate materials such as food and oil on the home-front provided the window of opportunity for the drys in Congress to usher in legislation that ensured national prohibition, created and regulated by the federal government. The drys argued that one way to conserve food would be to disallow brewers from using grains in their breweries and distilleries. In August 1917, Congress passed the Lever Food and Fuel Control Act which effectively shut down the distilleries by claiming that the conservation of such materials would help the war effort. On December 18, 1917, Congress passed the Eighteenth Amendment. The Senate approved the amendment by a vote of 65 to 20 and the House of Representative approved it with a vote of 282 to 128. On November 18, 1918, Congress passed the Wartime Prohibition Act even though the Armistice, which ended the war, occurred on November 8. This act banned the manufacture of beer and wine (if its alcoholic content was more than 2.75 percent) as of June 30, 1919. This act was passed even before the Eighteenth Amendment was ratified by the states. On January 16, 1919, Nebraska became the thirty-sixth state to ratify the Eighteenth Amendment. National prohibition would become the law of the land one year after ratification. In between Nebraska‘s ratification and the date of official enactment, House of Representatives Bill No. 6810 was presented by Representative Andrew J. Volstead of Minnesota. This bill, popularly referred to as the Volstead Act defined what an intoxicating beverage was and also provided for the formation of the Federal Prohibition Bureau as the preeminent prohibition enforcement agency. President Wilson vetoed the Volstead Act in October 1919, but his veto was soon overridden by Congress. The Volstead Act would became law on October 28, 1919. 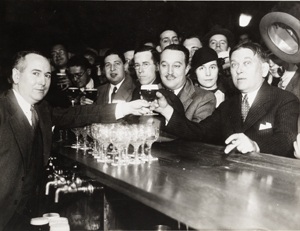 On January 17, 1920, national prohibition went into effect across the United States. Maryland’s importance during the era of prohibition has been largely ignored by those in the historical profession. Public sentiment, especially in Baltimore, greatly curbed the efficiency of prohibition in Maryland. Prohibition was destined to fail in Maryland because most of its people, from the lower classes to the higher classes, did not endorse or desire such a law. Eventually, by the late 1920s, most Americans would feel the same way as most Marylanders, and they would campaign for the repeal of prohibition. Maryland was a distinctive state in the 1918 to 1933 era. There is some irony that Maryland, which was seen as a pioneer in the temperance movement, came to be recognized as one of the wettest states in the union. Maryland’s geography, especially the Chesapeake Bay, made it a prime port of call for bootleggers. Marylanders themselves were a diverse people stemming from various cultures, groups, races, and religions. These distinctive qualities, when grouped together, formed a volatile combination in which prohibition was doomed to be a failure in the State of Maryland. State and local politics played an important role in dictating Maryland’s course of defiance during prohibition. Even though George W. Crabbe, superintendent of the Maryland Anti-Saloon League, felt that most Marylanders were in favor of prohibition, state and city political bodies clearly reflected an opposite point of view. Maryland’s Governor from 1920 to 1934, Albert C. Ritchie, was an ardent proponent of the wets and of Maryland’s right to determine its own laws and its own means of dealing with the alcohol traffic. Finally, the City of Baltimore plays a major role in the prohibition annals of Maryland. Baltimore was viewed as a “center of resistance to prohibition.“ Undeniably Baltimore was a “wet” city, which meant that Baltimore continued the selling, distributing, and consumption of illicit alcohol, under the auspices of city and state government. While some rural towns in Maryland did indeed favor prohibition, the more cosmopolitan and urban Baltimore refused to yield to such stringent federal infringement upon one of their most preferred forms of recreation and relaxation. Baltimore was home to many immigrant groups and races and also had a large African-American population. These groups were greatly affected by prohibition, whether they were for or against the Eighteenth Amendment. The city’s economy was affected, especially since employment in the trafficking of liquor was halted due to the fact that the city’s breweries and saloons were shut down. Because of the reasons given above, the era of prohibition in Baltimore and Maryland is important to the history of prohibition. Maryland’s diverse population, especially in Baltimore- home to half of the state’s population-is a unique case study in why prohibition was ultimately unsuccessful. Prohibition failed in Maryland because most Marylanders never wanted it to succeed. Indicative of the general mood in Maryland is the juxtaposition of the general dispiritedness to the start of prohibition in 1920, versus an ecstatic, festive atmosphere when it was repealed in 1933. STANDARD 1: How Progressives and others addressed problems of industrial capitalism, urbanization, and political corruption. Standard 1B: The student understands Progressivism at the national level. STANDARD 3: How the United States changed from the end of World War I to the eve of the Great Depression. Standard 3A: The student understands social tensions and their consequences in the postwar era. NOTES: Albert Cabell Ritchie was born in Richmond, Virginia on August 29, 1876, and was raised in Baltimore. He received his bachelor of arts degree from The Johns Hopkins University in 1896 and a law degree from the University of Maryland, where he later taught. He was serving as Attorney General of Maryland when tapped to run for Govenor by the Democratic party. First elected in 1919 by only 165 votes, Governor Ritchie went on to serve four terms in office. He was the first governor to be re-elected by popular vote. Among the many achievements of his administration was the improvement of state roads, reorganization of the public school system, and the revision of the Workmen's Compensation Act. Most important was the reorganization of state government begun under Governor Harrington, which Ritchie personally planned and implemented. After losing his 1932 bid for the Democratic presidential nomination, Ritchie declined Franklin Roosevelt's offer of the vice presidency. Defeated for a fifth term in 1934, Ritchie resumed the practice of law in Baltimore where he died on February 24, 1936. He was married from 1907 to 1916 to Elizabeth Catherine Baker of Catonsville. They had no children. TITLE: "State Rights Versus Prohibition Enforcement"
NOTES: This article reveals the feelings of many African-Americans in the fight for and against Prohibition. Many African-Americans, as evidenced by this article, equated the wet forces with those who advocated state rights, which to many African Americans, was still a pro-southern view of government from the Civil War Era. TITLE: Senate Hearings on the National prohibition Law, April 5-24, 1926.: Statement of William Cabell Bruce, U.S. Senator of the State of Maryland. NOTES: President Herbert C. Hoover established the Wickersham Commission in 1929 for the express purpose of studying and analyzing law enforcement, specifically the enforcement or lack thereof, of Prohibition in the United States. These are the conclusion and final report given to Hoover in 1931, which effectively states that the Commission opposes repeal of the 18th Amendment, but that enforcement of the Law needs to be applied by state and federal authorities in a more effective way. TITLE: "Mencken Sees Tranquility Arise in U.S. From Ashes of Prohibition"
NOTES: Shows the election returns of Prohibition Party candidates in the voting districts of Maryland. NOTES: This act repeals the liquor laws and codes of Baltimore County. NOTES: Document explains why the liquor license commissioner appointments were no longer needed due to the enactment of Prohibition in 1920. TITLE: "Arrests for Being Drunk Avg. Higher in U.S. this year than in 1924"
TITLE: "Speech of John Philip Hill of MD in House"
TITLE: "Revulsion Against Dry Law Apparent on Eastern Shore"
TITLE: "Senator Blaine asks for Dry Law Repeal"
TITLE: "Is Prohibition a Success After Five Years? No!" SOURCE: "Three Addresses on Prohibition"
TITLE: "Prominent MD Women Organize Dry Reform Group"
NOTES: This letter, from Rep. John Philip Hill to Governor Ritchie, both of whom are of the wet faction, raises the question of inequality in regards to Prohibition. Hill very much feels that the 18th Amendment is unconstitutional. NOTES: The AAPA was very much active in Maryland. This newsletter is just one example of how the AAPA had hoped to garner support for repeal of the 18th Amendment. The fact that such a newsletter exists in Governor Ritchie's files is further evidence on Ritchie's political stance on prohibition. TITLE: "Prohibition Repeal Is Ratified at 5:32 P.M.; Roosevelt Asks Nation to Bar the Saloon; New York Celebrates With Quiet Restraint"
TITLE: "The Uplifters Try it Again"
NOTES: Mencken uses this article to attack the moral up-lifters on their stance on gun control. Yet he also chastises them because of prohibition as well, drawing parallels between legislating morality in both cases. History Channel Classroom. Prohibition and Al Capone. 2001. Kerr, Austin. Temperance and Prohibition, 1997. NOTES: Professor Kerr, a history professor at the Ohio State University, is one of the leading scholars on Prohibition in the United States. He maintains this site and also publishes many books and articles on Prohibition. Zywocinski, Joan Rapczynski Florence. Prohibition as a Reform. Yale-New Haven Teachers Institute, 2003. Anti-Saloon League, 1893-1933. From the Westerville Public Library which houses the Anti-Saloon League Museum. The Prohibition Era: The Dry Crusade. From A&E Classrooms. The Prohibition Era: The Road To Repeal. From A&E Classrooms. The Prohibition Era: The Roaring Twenties. From A&E Classrooms. Brugger, Robert. "Searching For The Middle." In Maryland: A Middle Temperament. Baltimore: The Johns Hopkins University Press in association with the Maryland Historical Society, 1988. Chalkley, Tom. "Wet Stone", Baltimore City Paper, April 2-8, 2003. Distelrath, Art. John F. Wiessner & Sons Brewery, Baltimore Maryland, The American Breweriana Journal, issue #103,March-April 2000. Dobyns, Fletcher. The Amazing Story of Repeal: An Expose of the Power of Propaganda. Chicago, 1940. Hohner, Robert A. Prohibition & Politics: The Life of Bishop James Canon, Jr. University of South Carolina, 1999. Johnson, Gerald, Frank R, Kent, H.L. Mencken and Hamilton Owens. The Sun-papers of Baltimore. New York, 1937. Kelley, William J. Brewing in Maryland. Baltimore, 1965. Kyvig, David E. Repealing National Prohibition. Chicago, 1979. Mills, Eric Chesapeake Rum Runners of the Roaring Twenties. Centreville, 2000. Olson, Sherry H. Baltimore: The Building of an American City. Baltimore, 1996. Rose, Kenneth D. American Women & the Repeal of Prohibition. New York, 1996. Thornton, Mark. Alcohol Prohibition Was a Failure, 1991. Timberlake, James H. Prohibition and the Progressive Movement 1900-1920. Cambridge, 1963. White, Frank F. Jr. The Governors of Maryland. Annapolis, 1970. This document packet was researched and developed by Michael T. Walsh.